Of course we braai’d while we were away. Several times. 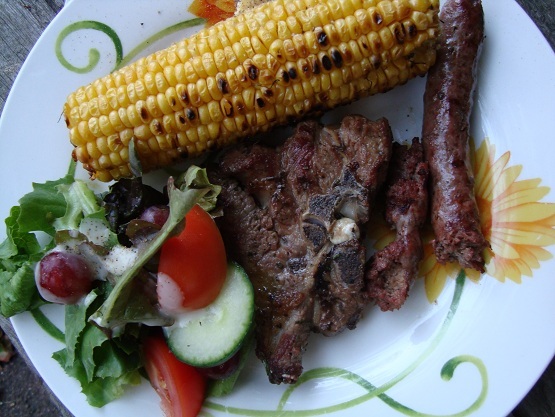 This was a traditional chops and ‘wors (boerewors) braai that we fancied up with some salad and corn. I think we were supposed to just eat meat really, possibly with some soft rolls for the boerewors, or some pap but the fridge was full of salad and I don’t really like the sound of pap. This particular boerewors didn’t behave very well and despite Stephen’s excellent technique with the braai tongs, it fell apart. We got it from Woolworths (Marks and Spencer is called Woolworths in SA), perhaps if we had stopped trying to posh everything up and just got it from Pick and Pay then it would have stayed in it’s spiral. It didn’t affect the taste though, obviously, and it was good. Mostly beef I think (again, not traditional I don’t think) and with a good amount of spice. Subscribe to comments with RSS	or TrackBack to 'Braai'. Usually the boerewors is a mixture of beef and pork but my mum doesn’t like eating pork so we bought a plain beef version. As Kerri said, we blame that for it not staying together very well!